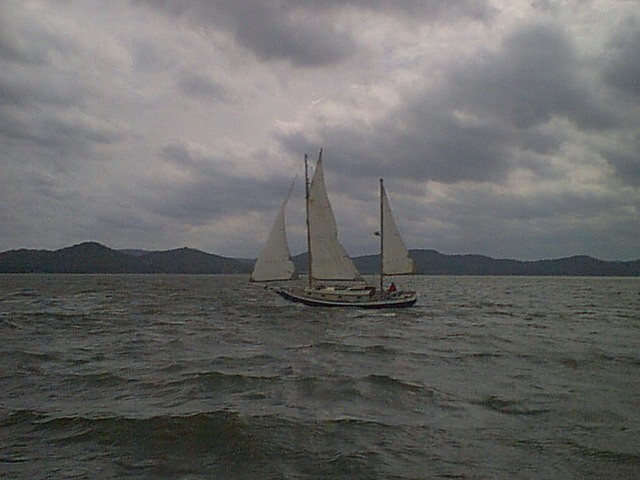 This race started out fine under heavy wind conditions. It wasn't raining though. 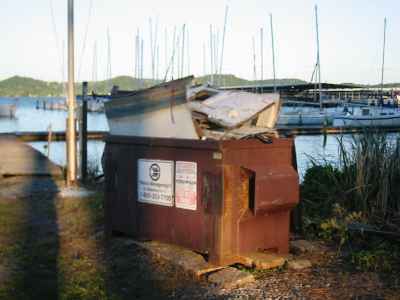 I left the dock single handed. I went out past the marina markers and raised sails. Then I ran into a couple of problems. First the mizzen goose neck came loose. Gee, that's what that laying on the deck is from! I got that back into place as I sailed through millfoil. I had never planned to do that since I was afraid I would get stuck. Instead, it made a nice 10 ft swath through it. Once out at the start line, I got ready to go through it. The idea is to cross the start line as soon as possible after the signal but not before it. I had to loop around a couple of times to make it between the ends of the start line. The race started at 0900. Then, my 4:1 ratio mainsheet went to a 1:1 ratio after the block slid off the end of the track. It shattered the little plastic end cap. I kept sailing that way until I came to a point where I had to tack. Then, as I went through the eye of the wind, I loosened the mainsheet, grabbed the block, and slid it back on the track. I then put the little metal slide back on, and this time made sure they were both tightened down secure. The rest of the first outbound leg was uneventful until I got to the Seyboldt light. I broached badly there and almost hit the light. I rounded it to port as I was supposed to though. 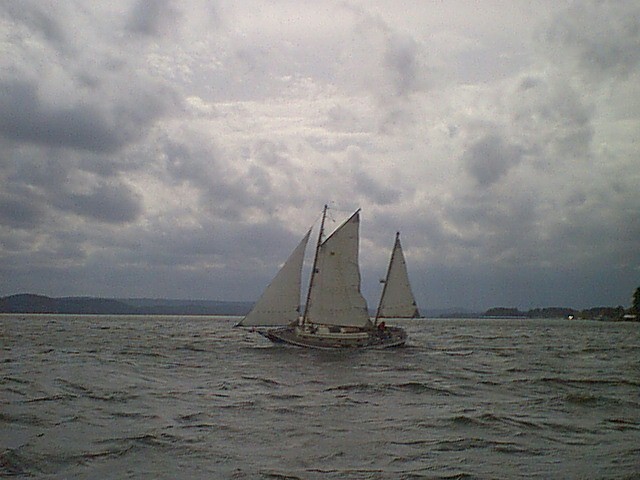 Normally, in heavy wind the mizzen comes down but since I was racing I kept it up. Later someone explained to me that whenever the boat broaches, to jiggle the rudder. 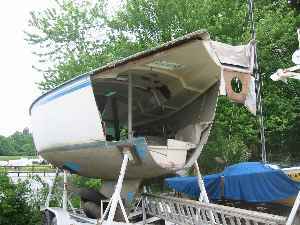 What has happened is that the water flowing around the rudder has cavitated or sucked down a lot of air, causing the rudder to lose its grip on the water. Jiggling the rudder lets this air free of the rudder. Now the rudder grips the water and controls the boat. On the way back to the starting point, the boat healed over so much that it was nearly horizontal in the water. Two drawers fell out, turned upside down, and dumped their contents on the sole. I let out some sheets to right the boat. I then returned to the starting point, rounded it and started my second lap. As I approached Seyboldt light, I saw a sailboat without a mast. I got closer, and saw the damage. 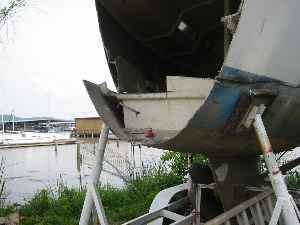 The starboard spreader boot had popped off and took the shroud with it. 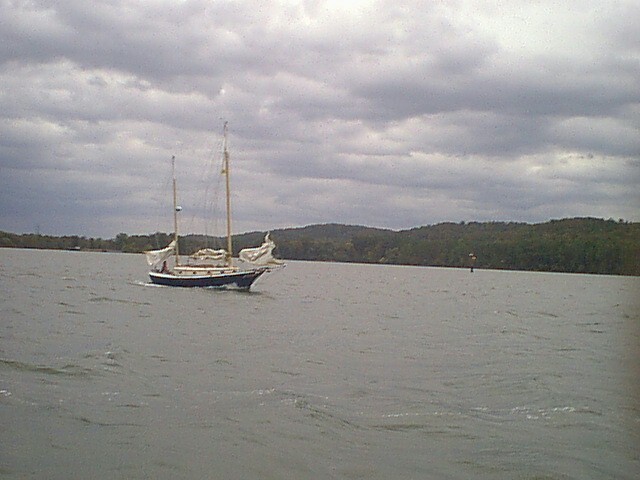 The mast then tore in the middle, bent double, and collapsed. 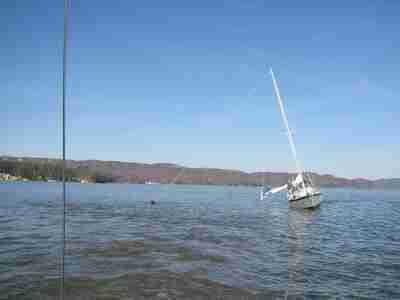 There was a guy in the water trying to get the mainsail off. I dropped out of the race and offered to help. He was in a bit of distress but no one was actually hurt. I and one other boat escorted him back to the marina. On the way back we tried to call the committee boat with no success. 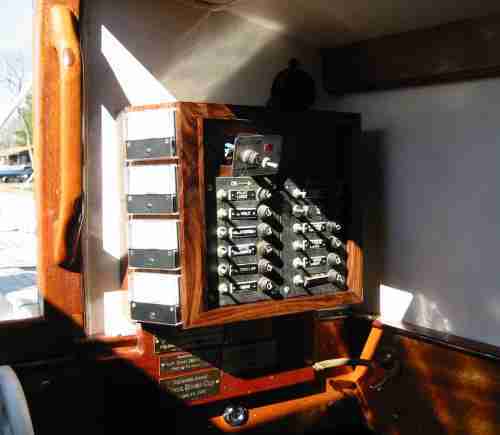 Later I heard that both VHF radios on the committee boat were out of order. Back at the dock, I helped the folks with the broken mast to dismantle the rigging. Then I went below to clean up the knee deep chaos. One guy said my housekeeping was poor. Today I needed to do a sail to make sure I put the rigging back together right. I had spent three days of the New Year's holidays installing an anchor light. Most of that I spent up near the top of the mast with a ladder. 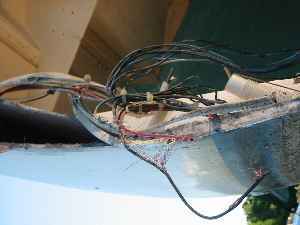 I had to fish the wire for the light through the mast. The first try I pushed the wire in the top. It just fed into a wad instead of going down. I then attached a weight to it from whatever I could find. It went down a bit, got hooked on something, and created a wad. I then taped a coat hanger wire to it and stuck it in again. It went down the length of the coat hanger wire and kind'a got stuck. 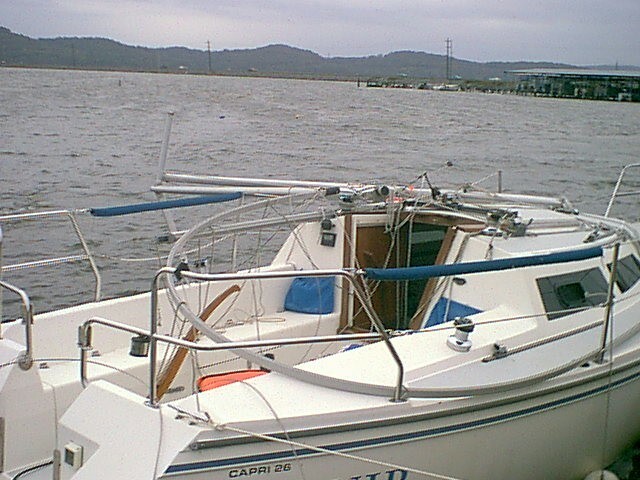 Now I had to take off the mount for the running back stays so I could see in the mast and see where the wire was going. I then used a screw driver to pull the wire out. I then threaded all 100 feet of wire through the top two feet of mast. Next, I had to get it down the rest of the way. I straightened out the coat hanger wire and stuck it back in the hole. I pushed it down and this time I could tell the wire was hanging straight down in the mast by the tension on it. I went to the cabin and tried to fish out the coathanger wire with a small wire hook. There was nothing. I went back up the ladder, pulled the wire out a bit and put it back in. Apparently it got hung up near the cabin top or the gooseneck. I was then able to fish it out the base of the mast. I finished mounting the light, hooked it up temporarily and applied power. It worked! I took the ladder home. Also I redid my electrical panel. There's still a bit to be done as you can see. With all that done ... it was time to test the boat - so to speak. I had done all the checks at the dock that I could. I got underway and raised the sails. Everything worked out normally but ... I had to go help my buddies out. Click here to see a video of this. The dot behind the boat is this guy. The video is 1.1 meg in size. After he got his boat off the sand pile he was able to enjoy the rest of the day. Here is a short video of that. This video is 800k in size. 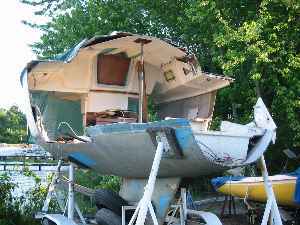 Ever wondered what would eventually happen to a fiberglass sailboat after it has aged and deteriorated to the point that the owner decides it can't be fixed or sold? Here is one example. 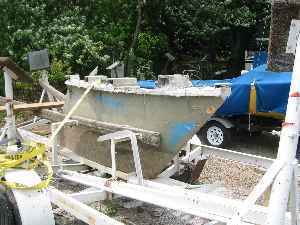 The boat had been damaged at one point by a crane falling on it. Maybe it could be repaired or maybe not. At this point only the engine was deemed salvageable. Here he has started slicing the bow off. He actually started with the transom. More of the bow is now removed so you can actually see for yourself how a transduer is mounted rather than relying on the diagrams in books or instructions. 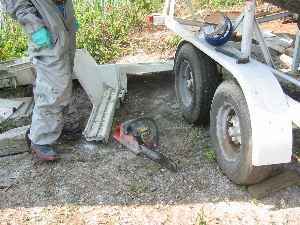 The fiberglass is scored with a chainsaw into 3' sections which are then pulled off. 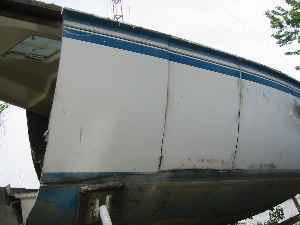 This takes hours to do each section because the fiberglass is so tough. These wires are really easy to access now if one wanted to make repairs. Now we are down to the galley area. The engine has already been removed. He had been working for hours in the hot Alabama spring. The saw was giving off smoke. After the sections are pulled off they are deposited here. All that's left is the keel. It was made of steel. I don't know what he did with it.